This quote reflects one of the biggest disconnects in customer experience – focusing only on the customer experience. It makes sense. Heck, that’s our name! Why wouldn’t we? But focusing only on the customer without regard to the employee experience leads to missed opportunities and sub-optimized efforts. We all want the discretionary effort – but it’s the first three that earn the right to ask for this extra focus. Unfortunately, we’re not doing so well at this. The measurement of engagement varies somewhat by thought leader, which means the percentage of engaged employees varies. But most are similar to the Temkin Group’s estimate, which is that only 33% of employees are highly engaged. Worse, only 26% of those who are 18 to 24 years old are highly engaged. Yet these are the people most likely to be servicing our customers, either in your call center or in other customer-facing roles. Until we can engage them, our customer experience will continue to suffer. Temkin goes further to show this impact. When expanding the definition to include those who are either highly or moderately engaged, they find that companies with CX worse than their competitors, about half (49%) are engaged. But at companies significantly better than competitors, that number increases to nearly 4 in 5 – 79%. We can argue which way the causation arrow goes – do more-engaged employees create a superior customer experience, or do companies who focus on improved customer experience have better employee outcomes? – but the linkage is clear. 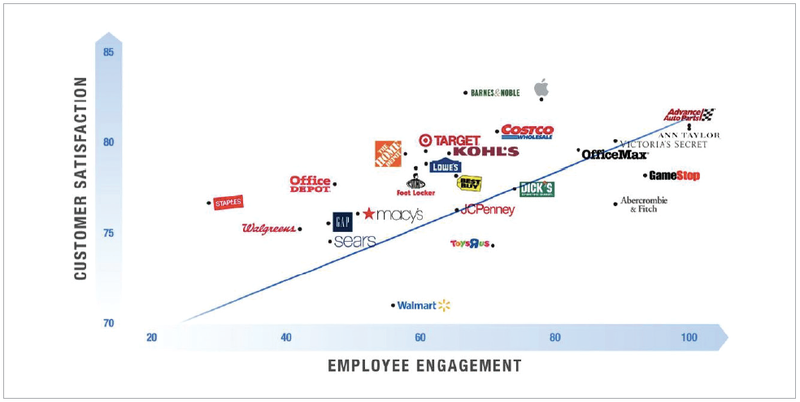 The retail space shows similar linkage, as shown in this graph from Great Customer Experience Starts with the right Corporate Culture, from Customer Relationship Management magazine. It’s tough to be engaged when it’s hard just to get your work done. This is where user experience comes in – creating better employee tools supports your customer experience. However, it appears that there’s still a ton of opportunity, as 59% of all workers are unhappy with their collaboration tools, as reported in Why Collaboration Tools are Crucial for Millennials in Business, Scalus. When you zero in on Millennials, the figure gets worse, with 71% dissatisfied. Millennials have become accustomed to easy experiences – and most CRM, ERP, and other internal tools are anything but. Outdated and inefficient systems, tools, and processes sap energy from employees, unnecessarily waste time, and make it difficult to serve the customer. Unintuitive systems require long onboarding time for training, keeping employees from doing the job they were hired for. It’s definitely worth it to take the time to apply the same user experience principles you use for your customers on your internal tools. Journey mapping is another useful tool for determining where problems are. We are receiving increased demand for employee journey mapping as a way to understand the points of friction in the internal experience. Outside-In thinking is critical. But inside-out action creates the needed change. As Peter Drucker famously said, “Culture eats strategy for breakfast.” You can focus on creating a better customer experience. But until you get the employee experience right, it’s an uphill battle. Unfortunately, our research has found that we in CX aren’t good at this area of focus. Despite the Temkin Group reporting that more CX professionals are focusing on Customer Centric Culture (74%) and Employee Communications and Engagement (69%) (see State of the CX Profession, 2018), our research in journey mapping found that 93% of the time, CX failed to invite HR to the project. This, despite the fact that every customer experience project is a culture project. Now, I get that some HR groups are more about compliance than culture change. But not 93% of them! If we don’t include HR, that means we’re missing a critical ally in the focus on culture. A focus on culture and the employee experience needs to be central to each CX leader’s plan. Partner with HR – but don’t outsource it. In my interviews with CX leaders, I find most don’t get involved with the employee engagement survey, preferring to let HR lead it. Yes, let them lead (and pay for) it. But get involved, so you can get the data right away and start planning action. Survey employees – If HR isn’t doing it, can your CX program take the lead? Keep it simple, ask open-ended questions on a few key topic areas such as workload, ease of getting things done, customer focus, managerial support, etc. Ask what to keep doing, start doing, and stop doing. Analyze and then (IMPORTANT) tell employees what you heard and what you are going to do. Then DO IT. Nothing improves employee engagement more than seeing feedback acted upon. Mission, Vision, Values – Does your organization have a Guiding Principles documents? What about a Strategic Framework or Mission Statement for the CX Program? If not, take the lead in getting them written and distributed. And discussed. Get everyone talking about customers – Help your senior execs see how CX information and success will engage employees, and get them talking about the customer in every communication – announcements, town halls, newsletters, videos, etc. Highlight employees doing the right thing. Package information for them to share. Set up some sort of internal social media – Yammer, for example, is a great way to connect employees. Use some of your CX budget to sponsor employee events – picnic, run/walk event, game tournaments, etc. Establish an employee peer-to-peer recognition program if one doesn’t exist. Enable employees to nominate others for great customer service, or just for being helpful and collaborative. Provide a small immediate reward ($10 Amazon gift card) to the nominee and then have an employee committee choose the best each month for a larger award ($100). Managers have a lot of reward levers, but putting a reward program in the hands of employees fosters great camaraderie and trust. If you focus exclusively on the customer experience, you’re missing half the equation. Adding a focus on the employee experience is the best way to ensure you create great experiences.